Chandelier Exits (CE) was authored by Chuck LeBeau. CE identifies stop loss exit points for long or short positions. Optional entry points are also displayed. CE uses an Exponential Moving Average to determine the current trend; then the Average True Range times a user defined factor is either, depending upon the trend, added or subtracted from the highest high or lowest low. Chandelier Exits (CE) set a trailing stop-loss based on the Average True Range. 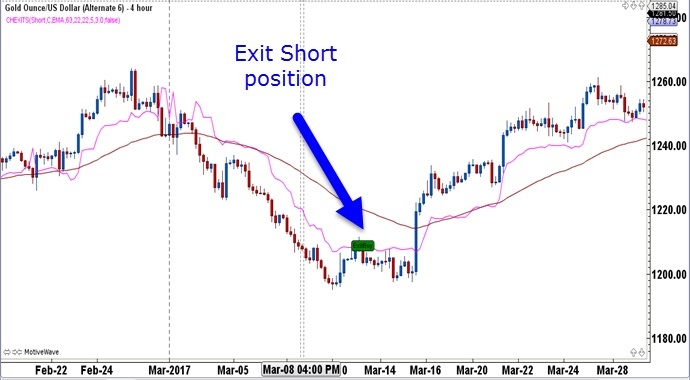 Once a trader enters either a long or short position, the indicator is set to long or short and produces a training stop-loss. 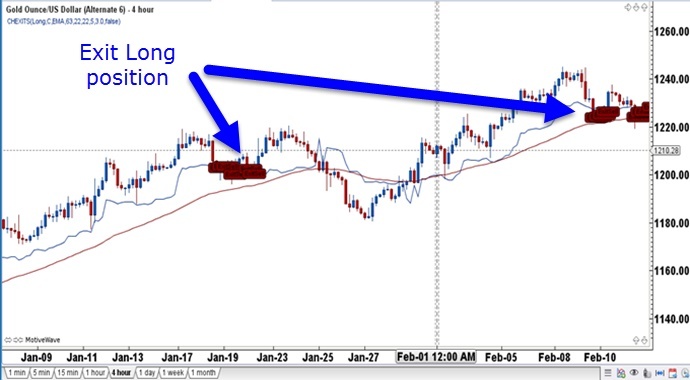 This indicator is designed to keep a trader in the trend trades for as long as the trend extends, when the typical trader will exit the trend early and not take advantage of the full move. The 63-period exponential moving average is how CE defines the current trend; when prices are above (below), the current trend is up (down). MotiveWave uses the default setting of 22 UpTrend and DnTrend Periods; CE looks for the highest high or lowest low of the last 22-periods and if using the daily charts, the period will be 22 days which is the number of trading days in a month. As per the formula above, the CE long takes 3 times the ATR (22) and subtracts it from the 22-period High to calculate the stop-loss. The chart below shows a 4-hour gold chart with the stop-losses calculated for a long position. As per the formula above, the CE short takes 3 times the ATR (22) and adds it to the 22-period High to calculate the stop-loss. The chart below shows a 4-hour gold chart with the stop-loss calculated for a short position. Chandelier Exits are based on volatility, as Le Beau defined volatility by using Average True Range, which was developed by Welles Wilder. The long exits are set three ATR values below the period high and the short exits are set three ATR values above the period low. Triggering these stops puts the current trend in question and it is better to be safe by capturing some of the trend, than to be sorry only to give back all the profits. Traders will often see a strong trend and not know where to trigger the long or short trade and where to exit. This indicator shows where to exit but it can also be used to show where to enter as in the same 4-hour gold chart below. 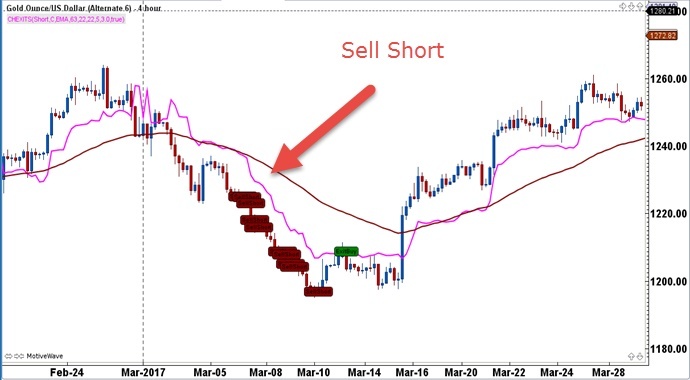 The trader can set the indicator to “Short” once price is below the 63-period EMA and trade short positions. The brown rectangles indicate shorts and the green rectangle is the stop-loss. This next example shows long trades on an hourly chart with the corresponding stop losses. Longs are entered once price is above the 63-period EMA (brown line) and the stop is calculated based on the formula above. 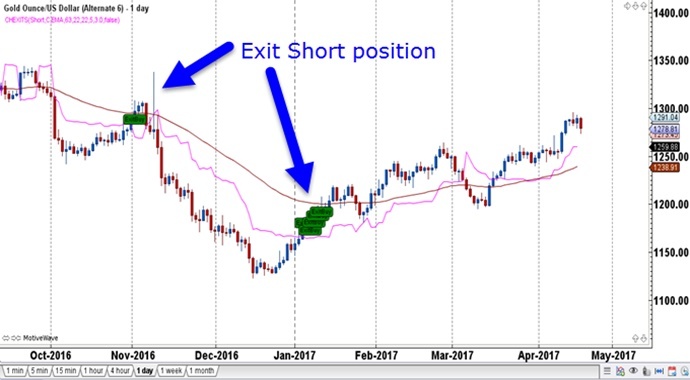 Learn how the Chandelier Exits help keep traders in the trend longer. Start incorporating the Chandelier Exits into your chart set-up. Finally, use the Chandelier Exits in developing trading strategies. 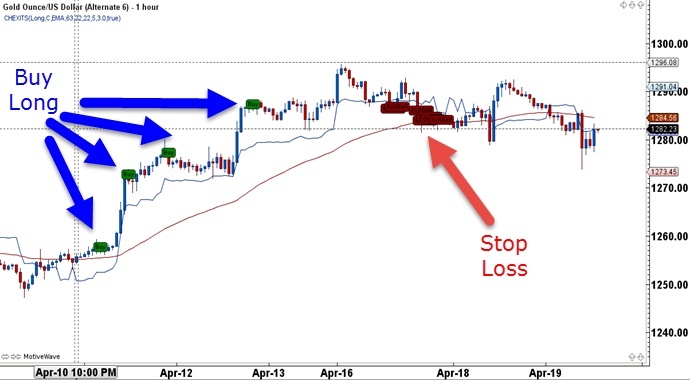 This entry was posted in Trading Tips and tagged Chandelier Exits, day trading, forex, forex trading, forex trading system, market analysis, trading, trading plan, trading strategy, trading system.